ONCE MEET, ALWAYS IN YOUR LIFE. INLYF bring you the most in life. Get INLYF space saver storage cube closet, create more room spaces. The storage shelf can be used to storage folding clothes, books, toys, artworks, shoes, pantry items and fabric drawers. This universal cube organizer is a perfect decor for living room, bedroom, kids room, cubby closet or entryway. Please message us if there are any wrong with the parts. We will do our best to solve it. It comes with 1 year warranty. Message us if you have any question. We are glad to hear from you. Quality material. Durable shelf is made of steel tubes, quality plastic connectors and waterproof non-woven fabric cover. Large Weight Capacity. It can meet your daily storage needs. 13.5lb load-bearing for each cube and 127lb for overall items. Large Storage Space. 9-cube closet offer large storage space. Each cube inside measures 12.5*11*16in. You also can place stuffs on 3 top fabric shelves. Enjoy fun of DIY. 9-cube allows you assemble it into different style according to your needs and preference. It is super easily to install. Side shelf design. Each cube comes with a side shelf to separate it from another cube and prevent your items from falling down to another side. If you have any questions about this product by INLYF, contact us by completing and submitting the form below. If you are looking for a specif part number, please include it with your message. 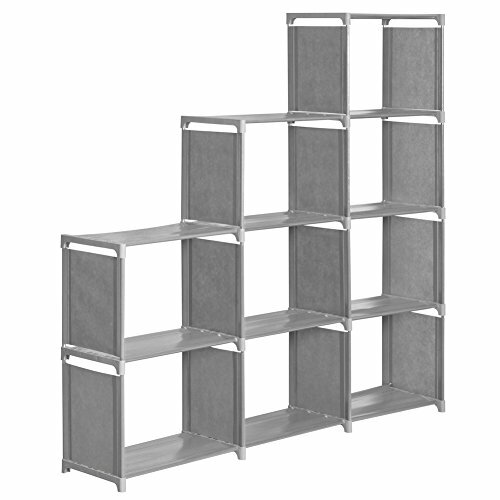 Slim Slide-Out 5-Tier Storage Tower - Ideal in Your Kitchen, Bath and Laundry Rooms!